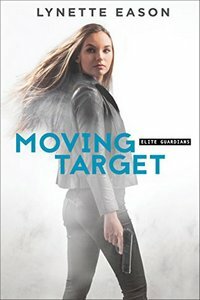 Moving Target by Lynette Eason, a Mysterious Review. Review: Maddy McKay is a former FBI agent who left to become a part of the Elite Guardian Protection Agency, an all-female team each with her own specific skill to insure the safeguard of a client. When FBI agent Detective Quinn Holcome tries to enlist Maddy’s help to investigate a current case involving a serial killer, she wonders if her feelings for him might interfere with her objectivity, in Moving Target, the third mystery in this series by Lynette Eason. But before she can agree to anything, they are both kidnapped, drugged and awaken in a cement room with no idea where they are or how they got there. It doesn’t take them long to realize that there is no way out of the room. They hear a voice and from the instructions they are given they realize they are being constrained by a madman. He calls himself the “Chosen One”. For a reason unknown to either of them, the man wants revenge. He opens the sealed room from above, tells them to run for their lives as he will hunt for them like animals using a crossbow bolt and two trained dogs. Maddy and Quinn must rely on their intellect and training to survive. This appears to be a game for the Chosen One so Maddy and Quinn do indeed run for their lives because if they know if they don’t win this game, they will die. Like the previous two books in this series, Moving Target is a captivating Christian-based romantic/suspense/mystery novel. Both the members of the Elite Guardian Protection Agency plus Quinn’s partner and a few other agents in the FBI become actively involved in the case. The characters are well written and believable. Maddy and Quinn, although both with troubled backgrounds, begin a budding romance in the midst of all the turmoil. This is another stirring mystery with a multitude of twists and turns yet with minimal blood and gore and no vile language. Highly recommended. Special thanks to guest reviewer Betty of The Betz Review for contributing her review of Moving Target. Acknowledgment: Baker Publishing Group provided a copy of Moving Target for this review.